One tenet of the American Recovery and Reinvestment Act of 2009 is to finance developments contributing to the nation’s future economic growth. 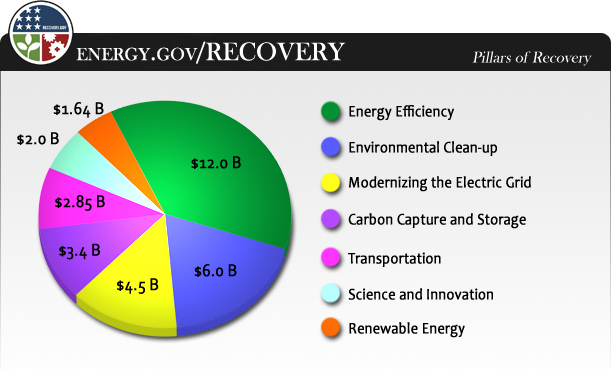 Specific to the U.S. Department of Energy (DOE), the act addressed seven areas: energy efficiency, environmental clean-up, modernizing the electric grid, carbon capture and storage, transportation, science and innovation, and renewable energy. Of the $1.64 billion designated for renewable energy, $350 million was devoted to geothermal energy, and of that, $68.2 million is contributing to enhanced geothermal systems technology research and development. The Newberry EGS Demonstration being conducted by AltaRock Energy is the largest and most technologically comprehensive of the seven EGS demonstrations across five states selected to receive funding. Of the $43.8 million required for this project, $21.4 million will be funded through the Recovery Act grant , and $22.4 million will be funded by the AltaRock Energy-Davenport Newberry partnership directly. In addition to the demonstration, Davenport Newberry has been awarded $5 million to validate an innovative exploration technology that allows scientists to identify previously-undiscovered geothermal resources. Why does this project matter? Why now? A 2007 study conducted by the Massachusetts Institute of Technology predicts that if EGS technology is appropriately developed, it will be able to provide 10% of the nation’s electricity needs in just 50 years—and do so at a price on par with non-renewably sourced fuels. And geothermal is a direct replacement for the fossil fuels currently powering the country – geothermal power stations run 24/7, unlike wind and solar, and so provide a renewable source of clean, baseload electricity. But technology development must come first. By investing in the Newberry EGS Demonstration, the Department of Energy supports innovation that has the potential to significantly alter the United States’ energy landscape. Our energy, our economy, and our self-reliance as a nation are inextricably linked, and the work underway at AltaRock’s Newberry EGS Demonstration is a valuable component of this much-needed progress. links to DOE site aren’t working, any chance of getting them updated? Good catch. I just updated the links to DOE.